A premium resin ribbon that offers exceptional abrasion and solvent resistance on a wide variety of substrates while still providing excellent edge definition. 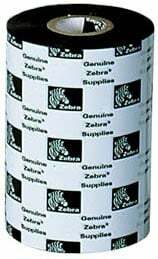 This ribbon is an excellent choice for printing extremely dense barcodes and high-resolution graphics. Its unique resin base provides excellent resistance to outdoor elements and chemical solvents. The Zebra 74943-R is also known as 74943-R	or 74943R	.